Home made w/ fresh vegetables, tender pieces of chicken & home made pasta. Sure to warm you up. Home made w/ fresh vegetables & smoked pieces of ham. Home made w/ fresh vegetables & small pieces of tripe. Tender pieces of beef slowly cooked in a rich paprika flavored sauce. Served w/ pasta, rice pilaf & carrots. Tender pieces of chicken slowly cooked in a rich paprika flavored sauce. Served w/ pasta, rice pilaf & carrots. Fresh cabbage, sour kraut & pieces of pork cooked until tender & flavored w/ hungarian seasonings. Pork-loin​ crispy on the outside & tender on the inside. Served w/ mashed potatoes, rice pilaf, carrots waxed yellow beans & sweet peas. White meat cooked to a golden crisp & served w/ mashed potatoes, rice pilaf, carrots, yellow beans & sweet peas. 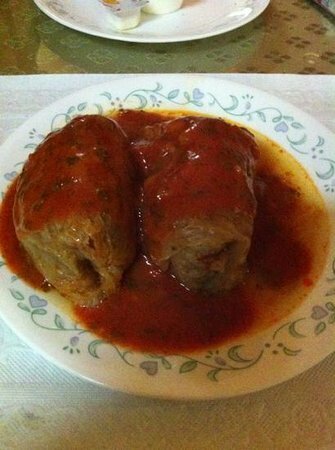 Tender cabbage stuffed w/ pork, rice & flavored w/ hungarian seasonings. Served w/ home made tomato sauce & home made brios. This dish is very specific to eastern europe. Yellow peppers stuffed w/ pork, rice & flavored w/ our hungarian spices. Served w/ pasta & home made tomato sauce. 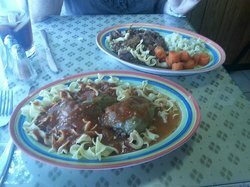 Shredded zucchini in a light sour cream sauce served w/ meatballs, mashed potatoes, carrots & read beet salad. Boneless breast of chicken stuffed w/ provolone cheese, ham & served w/ mashed potatoes, rice pilaf & home made dill sauce. Seasoned & baked in the oven. Served w/ mashed potatoes, rice pilaf & waxed yellow beans. Dobos Torte - It's Eight-Layers of Roasted Almond Sponge Cake, Layered w/ Chocolate Buttercream & Topped w/ Thin Caramel. 우리는 그곳에서 스낵을 주문한 파이 볏가을을. 그는 맛있었고, 신선하고 풍성한 양도. 카운터의 친절하고 좋은 사람이고. 그들은 정말 좋은 날 다시 가서 점심과 저녁 식사가 헝가리 음식 다하고 있습니다. 랄라 하고 가서 산책하며 맨체스터 가는 점심. 여섯 가지의 다양한 음식을 즐길 수 있는 스프를 먹다. 숨겨진 보석 같은 곳입니다. 데코레이션을 한 동시에 음식과 파이 지 않은 사람이 있습니다. 음식은 훌륭했고, 매우 큰 부분, 저렴한 가격과 적절한 서비스가. 이 짧은 3분 정도 걸으면 시내에 래디슨 호텔 맨체스터 nh. 몇 가지 음료 맥주 와인 선택 사용할 수 없음 또는 하드 라. 헝가리 에 있는 체크 아웃. 정말 맛있었다. 가볼 가치가. 나는 주인 과도 조금. 나는 나쁜 기분이 나 저녁 식사를 할 수 없을 앙트레. 점심은 약 $20.00 사막 두가지! 저는 점심 식사를 맛있는 요리가 $5 만을 정말 놀랐습니다! 쇠고기 굴 라 하는 것은 아주 좋았습니다! 이 안은 미소하지 않았다, 하지만 음식을 좋아했다! Lala's Hungarian Pastry 직원 및 이전 방문객에게서 빠른 답변을 구하세요.